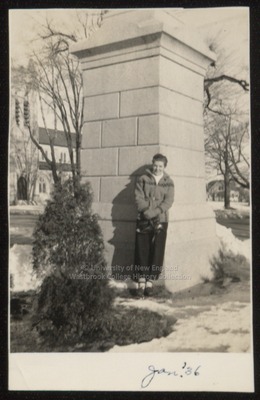 Westbrook Junior College student Shirley Cole stands at the Evergreen Cemetery main gate in this black & white candid snapshot with Jan. '36 written on the front. Shirley wears her same winter jacket. Her dark flowing pantaloons are accentuated with heavy socks and flat shoes. Her hair is short. She leans against the gate brick pillar one arm crossed over the other. On the back of the photo is written in blue ink: "Shirley Cole cemetery gate."